A curated list of more than 250 must-see destinations organized geographically from Maine to Florida Featuring architecture by some of the biggest Mid-Century names, including Mies van der Rohe, Marcel Breuer, Eero Saarinen, and Philip Johnson, each of the more than 250 buildings is located on a regional map. The book includes all the additional information needed to find a A curated list of more than 250 must-see destinations organized geographically from Maine to Florida Featuring architecture by some of the biggest Mid-Century names, including Mies van der Rohe, Marcel Breuer, Eero Saarinen, and Philip Johnson, each of the more than 250 buildings is located on a regional map. The book includes all the additional information needed to find and visit each building. Its cool and functional design makes this book a coveted Modernist-style object in itself. Including icons from The Met Breuer to the fabulous beach houses of Fire Island, private homes in Connecticut, Manhattan skyscrapers, and the Tropical Modern residences of Sarasota, Florida, it is a must-have guide to one of the most fertile and lesser-known regions for the development of Mid-Century Modern architecture. 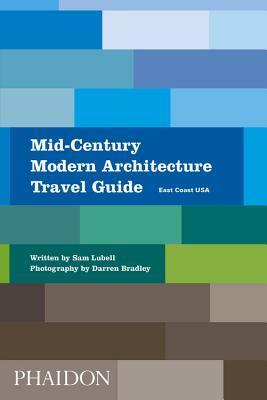 From the publisher of Mid-Century Modern Architecture Travel Guide: West Coast USA.